This is the fourth and last article in a series addressing canine cardiac diseases, with an emphasis on diseases that more commonly afflict Bichons Frises. Refer to the first article in the series www.bichonhealth.org/HealthInfo/CanineCardiac.htm while you read this article, for descriptions of basic cardiac anatomy and blood flow through the heart. Cardiac disease in dogs is prevalent, accounting for about 11% of dogs seen by veterinarians, of which 75-80% have chronic valve diseases. At least 3 million dogs examined by veterinarians via ultrasounds in the US have acquired heart diseases and may be in heart failure. Cardiac disease is the third most common cause of death in dogs less than 10 years of age. Mitral valve disease, which can be acquired and/or hereditary, is the most common cardiac disease in dogs. Acquired heart diseases strike after puppyhood, during or after the breeding years. Acquired heart diseases, both inherited and obtained from influences outside the body such as infections, is the focus of this article. The incidence of cardiac disease in Bichons has risen significantly in the last few years, moving from the #11 position to #7. Hopefully this article will encourage Bichon breeders to obtain the OFA cardiac certifications prior to breeding, reduce the incidence of heart disease in Bichons, and help improve the health of our beloved Bichons. The focus of this article will be chronic degenerative valve disease, the most common canine cardiac disease. 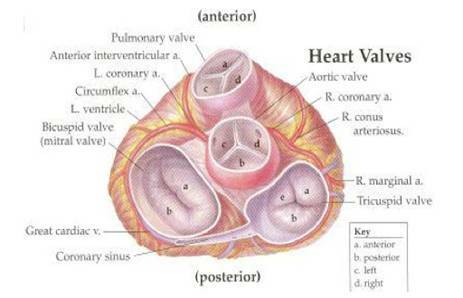 Of the 4 cardiac valves, the mitral valve is most often affected. Chronic valve disease most commonly afflicts small to medium dogs that are middle age or older, with estimates that 25-30% of older small breed dogs are affected. There are several reported cases of valve disease in Bichons, and many reports of clinical signs that may indicate valve disease, but no definitive diagnosis was obtained. Coronary artery disease that leads to heart attacks, another acquired heart disease that also has a genetic component, is very rare in dogs most likely due to their short lifespan (this disease requires many years to develop) and how they synthesize lipids (fats in the blood). Hyperlipidemia (elevated cholesterol and other lipids in the blood), one of the major risk factors for coronary artery disease, is extremely rare in dogs but is hereditary in a few breeds and some mixed breeds. Hyperlipidemia may also occur as a consequence of other diseases such as diabetes, pancreatitis, or hypothyroidism. Currently, there are 2 reports of Bichons with coronary artery disease, and one with hyperlipidemia. Autoimmune disorders than can cause coronary artery disease are atherosclerosis and vasculitis (inflammation of the blood vessels). See this article on the Bichon health web site for more information: www.bichonhealth.org/HealthInfo/DefAutoimmune.htm. In most cases, development of chronic valve disease is suspected to be genetic and discovered later in the dog’s life. If the disease occurs early in a dog’s life, it is assumed to be genetic. There are rare cases reported of mitral valve dysplasia (abnormal development) present in embryos, which would define the disease as congenital. Infections can cause damage to heart valves, which is not considered hereditary. Normally, microorganisms (bacteria, viruses, fungi) are present on your skin and in your mouth, intestines, and urinary tract. The blood is normally free of microorganisms, but they can gain access to the bloodstream during dental or surgical procedures. In addition, the mouth is a very vascular area, so infections present in the teeth and gums can gain access to the bloodstream. These microorganisms can travel quickly to the heart due to its proximity to the mouth, causing damage to the heart valves and/or endocarditis, infection of the lining of the inside of the heart chambers. The leaflets of the valves become malformed and thickened. As the heart valves and endocardium heal, clumps of tissue form called vegetations. If large enough pieces of the vegetations break off, they can travel to blood vessels and block blood flow, causing dangerous circumstances such as a stroke or a pulmonary embolism. In addition, diseased gums can release high levels of bacterial pro-inflammatory components that travel through the bloodstream and damage the heart and other organs. Prevention of dental disease with good oral hygiene is paramount to prevent damage to the heart valves, considering that dental disease is the #4 disease in Bichons. This involves brushing your Bichon’s teeth at least weekly, providing bones to chew that aid in cleaning the teeth, avoiding tartar accumulation, and aggressively treating any broken or infected teeth or gums. Myxomatous mitral valve disease is the most common acquired heart disease in adult dogs. This develops as a result of mucus replacing connective tissue in the leaflets of the mitral valve, which thicken causing incompetence in the valve. The end result is a fibrous tumor, called a myxoma that in some humans can be removed. The transmission of this disease is suspected to be hereditary in dogs, evidenced by the strong association in certain breeds. At this time, this disease has not been reported to the BFCA health committee. Rheumatic fever is an autoimmune disease that can develop after a strep throat infection in humans, leading to inflammation and damage of the heart valves, but this does not seem to exist is dogs. However, an autoimmune inflammation of the heart and valves can develop in dogs. 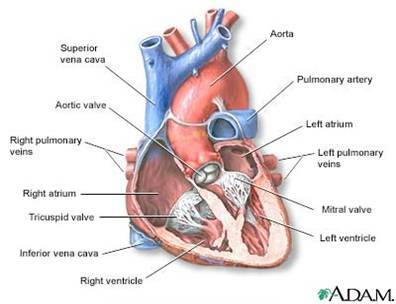 The heart valves function like trap doors to direct blood flow correctly through the heart. The mitral valve is the most significant valve, opening to allow oxygen-rich blood to flow from the lungs into the left ventricle where it is pumped to the body and organs. The mitral valve closes when the left ventricle is contracting to prevent blood from leaking up into the left atrium, thereby promoting forward flow of blood through the aorta and to the body. 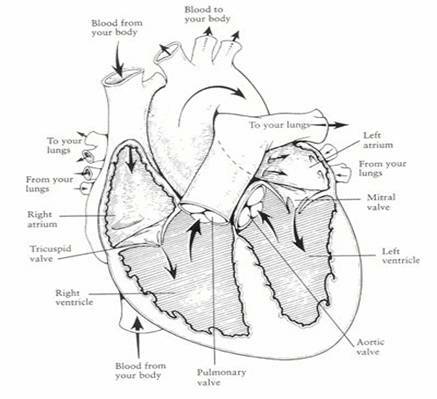 Enduring the highest pressures inside the heart chambers, the mitral valve is most commonly diseased, followed next by the aortic valve that opens to allow blood flow out of the heart into the aorta, and to the body (See figure 1). In addition, the chords that attach the leaflets of the mitral valve to the wall of the left ventricle are easily weakened and provide optimal surfaces for growth of vegetation (See figure 2). Mitral valve insufficiency, also called mitral regurgitation, occurs when the mitral valve is damaged to the extent that it cannot close tightly, so it leaks. This allows blood to flow backward up into the left atrium when the left ventricle is ejecting blood into the aorta, diminishing the amount of blood that is sent to the body and causing a murmur due to turbulent blood flow. The left atrium gets overloaded with blood, causing it to dilate. Because there are no valves between the left atrium and the lungs, the excess blood and pressure in the left atrium is transmitted to the lungs causing congestion with respiratory symptoms. Next, the right ventricle has to pump blood to the lungs against the resistance of the excess blood and pressure, leading to failure of the right ventricle as a pump. The left ventricle, responsible for our blood pressure, also fails because it must pump the excess blood volume that resides in the enlarged left atrium when it empties into the ventricle. The net result is failure of both ventricles, i.e. heart failure (See figure 3). One other cause of mitral insufficiency is dilated cardiomyopathy, in which the dilated left ventricle dilates the rings that surround the leaflets of the valve, rendering the valve incompetent due to the inability of the leaflets to close properly. (See figure 4). 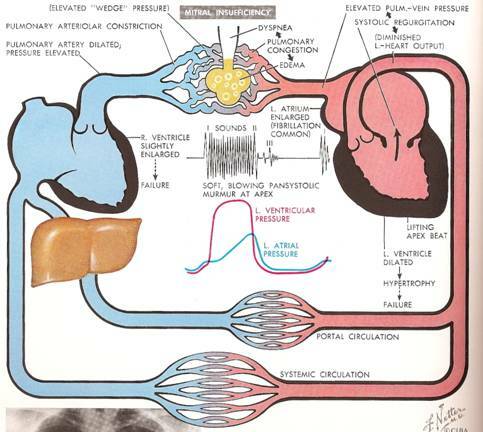 This diagram is very busy, but is a good example of the effects of an incompetent mitral valve. The right and left ventricles are separated to demonstrate the impact on their particular circuits of the cardiovascular system. Note the increased size of the left atrium as compared to the right atrium. Cardiac valve diseases eventually lead to heart failure, also called congestive heart failure (CHF), which is defined as failure of the heart as a pump. The result is that the heart is unable to supply the body and organs with sufficient flow of oxygen-rich blood. The heart does not stop, but functions less efficiently. This inefficiency is due to weakened muscles in the ventricles, the major pumping chambers of the heart, causing backup of blood into the venous system and the lungs. To help you understand this process, see my toilet analogy in this article posted on the Bichon health web site: www.bichonhealth.org/HealthInfo/CanineCardiac.htm, (and figure 1). The heart attempts to compensate for the reduced pumping ability by increasing the heart rate, allowing more outflow of blood from more frequent heartbeats. Despite many compensatory mechanisms in the heart and body that preserve the balance short term, in time the stress on the heart takes its toll. Heart failure ranges in severity from mild with minimal or no symptoms, to severe. Initially, clinical signs of heart failure are mild, vague, and easy to overlook. As time passes more blood backs up into the lungs causing exercise intolerance, loss of appetite, rapid respirations, and frequent coughing that can easily be mistaken for a respiratory infection such as kennel cough. Blood also backs up into the venous system causing engorged neck veins, liver enlargement, and swelling in the abdomen and legs. Without adequate blood flow, organs in the body malfunction and eventually fail, thus causing more severe clinical signs, such as kidney failure. Heart murmurs, abnormal heart sounds, or irregularities in the heart beats (arrhythmias) detected during a veterinary exam are the hallmark of cardiac diseases and may be detected before any symptoms are present, highlighting the importance of an annual veterinary exam, OFA cardiac certification, and the puppy exam before leaving the breeder. MVD is primarily an adult-onset disease, so signs may not be apparent until well into the breeding years. The first clinical sign that precedes symptoms is a murmur that can be detected by a veterinarian during an annual exam or during an OFA cardiac exam. A skilled clinician, such as a canine cardiologist, will suspect MVD by the characteristics of the murmur and its location on the chest wall. A definitive diagnosis of MVD can be obtained by echocardiography (ultrasound) that will demonstrate the regurgitation of blood through the mitral valve. If echo is not available, a presumptive diagnosis of MVD is based upon the physical examination, the characteristics and location of the murmur, and clinical signs of heart failure; a chest xray that reveals an enlarged heart with congested lungs; and an electrocardiogram that reflects enlarged ventricles and left atrium with possible irregularities in the heart rhythm due to enlarged heart chambers. An additional blood test may reveal elevated atrial natriuretic peptide (ANP or proANP) that correlates with the severity of heart failure. Heart failure causes increased pressure in the atria (the heart chambers above the ventricles) as the blood backs up from the weakened ventricles that cannot empty properly. The increased pressure in the atria stimulates the release of the hormone ANP. Early detection of heart failure facilitates more effective treatment, and screens dogs that may need further evaluation. A new screening tool for proANP can be obtained from NationWide Laboratories called “Canine Cardiac Screen” at this web address www.nwlabs.co.uk/canine-cardiac-screen.html. The only cure is to replace the defective valve with a prosthetic valve or to surgically repair the valve, as done in humans and rarely in dogs. In humans surgery is avoided until signs of heart failure begin, allowing the superior native valve to last as long as possible. These surgeries are considered pioneering in dogs, not experimental. The major limitation is the size of the dog, so most surgeons limit this surgery to dogs that weigh at least 18-22 pounds, ruling out the majority Bichons. Earlier medical treatment, prior to symptoms of heart failure, will produce a better outcome. The ultimate goal of medical therapy is to make the dog comfortable and prolong its life, accomplished by drugs than strengthen the heart, dietary manipulations, and activity level modifications. Dietary supplements that promote a healthy heart include fish oils, multiple vitamins that contain minerals and the B vitamins, Vitamin E, Taurine, L-carnitine, and Coenzyme Q10. However, there are no formal studies to prove that these supplements benefit the heart. Sodium restriction in the diet is essential to avoid stressing the heart and lungs with excess fluid. Beware that high levels of sodium can be hidden in cheese, lunchmeats, canned dog foods, and most dog biscuits and treats. Many commercial dry kibbles do not indicate the levels of sodium. The best diet to avoid sodium is fresh raw foods and avoiding table scraps. Also, low sodium prescription diets are available through your veterinarian. Limit strenuous activities to allow for adequate rest. Maintain a normal weight since extra pounds strain the heart. Seek veterinary services for any signs of respiratory distress, progressive lethargy, or fainting. New technology-stem cells: Any disease that results from a premature loss of cells has the potential for benefit from treatment with stem cells that can be obtained from the dog’s intrinsic cells or a close relative. Myocardial (heart muscle) cells do not regenerate after injury, however stem cells may be able to generate new myocardial cells to replace those that died and to repair some of the damaged cells. The stem cells are injected intravenously with hopes they will migrate to the heart, or they are injected into the coronary arterial system, or directly into the heart muscle. Specific genes for mitral valve disease have not yet been identified in dogs, but the mode of inheritance is suspected to be polygenic, meaning that several defective genes produce a disease at random, with at least one gene originating from each parent who may be affected or carriers. If a cause can be determined other than genetics, then mitral valve disease can be labeled acquired. Affected dogs should be removed from the breeding program not only for genetic reasons, but also their fertility and ability to tolerate mating, pregnancy, and whelping may be in jeopardy. Siblings and parents of affected dogs should only be used after careful cardiac screening. Avoid repeating a breeding of the same parents or related dogs. See the link below to Dr. Jerold Bell’s article for more information on modes of inheritance. Avoid breeding Bichons with significant dental disease that is suspected to be genetic, and may be linked to weak lower jaws. Dental disease can lead to cardiac valve disease due to bacteria becoming blood borne and traveling to the heart, damaging the valves. Provide optimal dental hygiene to your Bichons to prevent dental infections. Share any knowledge of Bichons in your breeding program with cardiac diseases so other breeders can make informed, selective breedings. The BFCA Health Committee feels that this disease deserves vigilance. You are encouraged to share data with the committee on any Bichons with cardiac valve diseases, which will remain confidential, so that current trends in health problems in Bichons are evident. Many reports submitted indicate Bichons with heart failure and murmurs, but no actual diagnosis. More data is needed on the prevalence of specific heart diseases in Bichons. Contact either a committee member, or complete a health incident form located on www.bichonhealth.org.